This is part one of a series of technical articles on the aerodynamics of control-line flying. 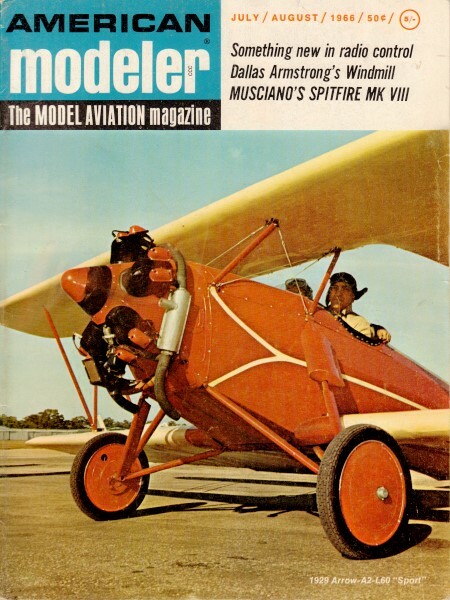 It appeared in the July/August 1966 edition of American modeler. Here is Part 3. The Academy of Model Aeronautics is granted tax-exempt status because part of its charter is for activity as an educational organization. I think as time goes on, it gets harder for the AMA for fulfill that part of its mission because presenting anything even vaguely resembling mathematics or science to kids (or to most adults for that matter), is the kiss of death for gaining or retaining interest. 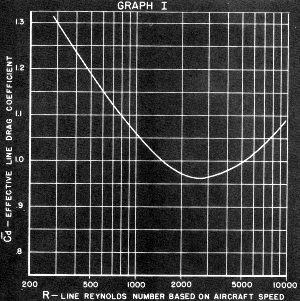 This article, "Control-Line Aerodynamics Made Painless," was printed in the July/August 1966 edition of American Modeler, when graphs, charts, and equations were not eschewed by modelers. It is awesome. On rare occasions a similar type article will appear nowadays in Model Aviation for topics like basic aerodynamics and battery / motor parameters. Nowadays, it seems, the most rigorous classroom material that the AMA can manage to slip into schools is a box of gliders and a PowerPoint presentation. That and a few scholarships each year keep the tax status safe... for now. 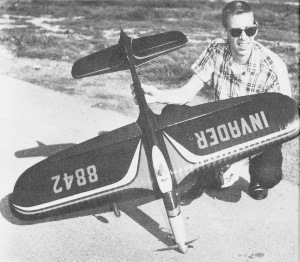 Roger Wildman with his Invader, one of several aerobatic aircraft used to check out calculations. Weighs 60 ozs., McCoy 0.40, 600 squares, 48 mph. Figure I. Crux of the matter. Behind the charts stands years of flight testing. Crewcut Bill goes long-hair! And he has conspirators, many of the nation's leading designers. Line rake angle is an all-important factor, they agree. Since the beginning of control-line models, back in the 40's, the design phase, viewed from published information, has been a "black art" relying on phases of the moon, superstition, etc. "Designers" appeared to ignore, or misunderstand, the unique effects of flying in circles tied to a pilot in the center. We were told to balance the model on front lead-out; or balance it on the bellcrank pivot; or to balance one thumbprint forward of the main spar, or any other such nonsense that popped into a designer's head. All we really knew was that his model balanced there and he liked it! Always they were half right-and half wrong. Actually, we lived by the "Flea Fright" practice of adjusting each ship to tailor out the kinks, if it survived the first flight! Ultimately, we were subjected to a lot of marginal designs (mine, too) flown by talented pilots who took it upon themselves to explain phenomena they didn't understand. Luckily, we do not wipe out pilots during crashes. Back in 1951 I started serious investigation into miniature aerodynamics. It is simply a matter of applying classic aerodynamics to our size whenever we could. The principles, happily enough, apply directly; the problems are in the constants. Guess and test methods were used to backup mathematical correction of lift, drag and inertia factors, finally coming up with "numbers" useful to our size airplanes. One slight point irks me. Only a scale model of a man-carrying airplane qualifies for the name "model." If we design an airplane for a specific performance criterion, then it's an airplane, no matter how small! In future issue we'll present a generous portion of concentrated CL aerodynamics; concentrated meaning, any mathematical procedure will be explained in English and useful equations will be reduced to simple nomographs. We will be shooting for those of you interested in knowing Why and How, but who have not elected to follow a career in engineering or science. We assume that Math and Aero majors will be reading very critically looking for mistakes! Basic Physical Facts: This installment covers a phenomenon not recognized in any other branch of science, at least not in books I've been able to read. So we had to develop our solution. We tie our airplane to a handle, pick up that handle and stand there while the airplane zooms around us. The physical reactions caused by moving a body (object) in a hemispherical plane, supported by thin flexible lines, with motive power applied at the object, are unique to CL airplanes. Flying above the handle introduces forces not covered in classic aerodynamic work, and the effects of the lines themselves are interesting. Our phenomenon is the curve that appears in the lines: How do we measure it accurately, its effect on the airplane, and what do we do in the design of the airplane to achieve the best performance? Where should the line-guide be located? Since Isaac Newton discovered that an object pulled by a force tends to move in a straight line, we must apply another force to make that object move in a circle. This is called Centripetal Force, which you apply at the handle. There then exists an equal and opposite force to balance it called Centrifugal Force. (EQ 1) These two keep the circle round because, if unbalanced, like a broken line, the object heads back toward its straight line. The amount of centripetal force is determined by the weight of the airplane, the angular rate at which it moves around the circle, and the length of the lines. For our purposes we convert angular velocity to tangential velocity and call this the airplane speed (V) generally in miles per hour (mph). By convention, we make lines to a length which will give standard distance from handle to airplane centerline. 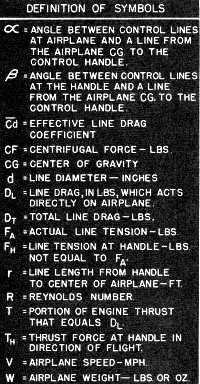 The center of gravity (CG) of the airplane is very close to center­line, so we now state that airplane speed (V) is that of CG. To simplify matters let's assume the Thrust of the prop passes through the CG. This done we could throwaway the airplane and use a dimensionless lump, same weight, at the CG. If it were possible to mount the bellcrank pivot exactly on the CG and the load of each line didn't change (it does) we could fly without a line guide. Since precise location is not practical, we add some form of line support between the bellcrank and the handle. After adding the line-guide one problem is solved, another created. For years we were fooled into believ­ing that the position of the bellcrank in the airplane controlled its attitude. Not so. The bellcrank can be almost anywhere in the airplane. 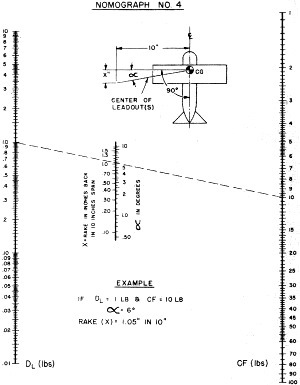 A simple cardboard outline of an airplane will show this relation (photograph in continued portion). Place an eye (U-shaped bent pin) in one wing tip and tie a pin on the end of a thread. Run the thread through the eye and stick a pin anywhere in the cardboard. We must qualify the above facts by stating that the line must be very flexible compared to the weight of the airplane. A perfectly flexible wire can carry no side load without bending. Misplaced bell crank side load is re­acted inside the airplane, not appear as an aerodynamic force. Notice that this effect is factual for the fore-and-aft and also the vertical position of the CG. Were you to use say 1/16-in. diameter lead-outs on a V2 A ship, running them beyond the line guide 4 or 5% of the total line length, and then placing the bell crank at a kooky position, you have established an exception. All practical cases so far. The next problem is line shape. Closest parallel in engineering mechanics is the Catenary, a curved line between two points similar to a slack flexible cord hanging between two poles. This cord is assumed to be carrying only its own weight (uniformly distributed load) and its hangs in a mathematically predictable shape. The point of maximum deflection from a straight line between the support points is in the exact center of the wire. The deflection is inversely proportional to the tension in the line (more tension, smaller deflection), and directly proportional to the weight of the lines. You can demonstrate this one with a piece of control line, so we'll not describe the experiment. It will prove that in horizontal flight your lines will droop from gravity causing a slight vertical angle leading into the airplane CG. For most airplanes "going around flat and fast" this angle is too small to measure. To determine line shape in the horizontal plane (top view), we resort to forces shown in Fig. 1. Here the load on the line is not uniformly distributed. Load is caused by aerodynamic drag which is proportional to a constant times velocity squared. 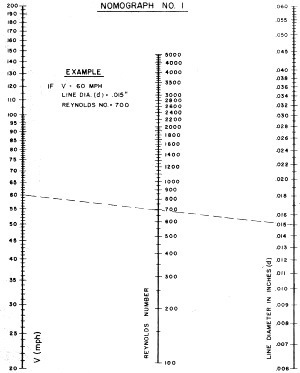 The velocity of the wire is assumed to be zero at the handle end (as in a pylon) and increases directly proportional to the distance away from the handle finally reaching airplane speed (V). Therefore, each little piece of line travels at a different velocity. This dictates the process of mathematical summation to find line drag. (More later.) To move this force system we apply thrust (T) to the CG, T being just enough to carry the effective line drag (DL). To establish equilibrium in the system we need a thrust at the handle (TH). Surprised? Fact is, without a pylon, whipping is a way of life. (Say it isn't so!-Ed.) At a later time we'll show how to whip best. But back to the lines. It is conventional in vector analysis to resolve a vector (a force with a definite magnitude and direction) into two vectors 90° apart, or vice versa. Thus, vector force FA (line tension) is the combined result of T and CF. It has an angular relationship to both, but we're interested in its angular relation to the line of action for CF. This is (∞) Eq. 2. Likewise angle (f3) Eq. 3 is related to FH, TH and Centripetal Force (not shown). Once we know (∞) we know where to place the line guide! The development of an exact equation for (∞) was a laborious chore. We'll not cover every detail, but a brief history should be enlightening. Math Solution Development: Progress started in response to my published force diagram inside the airplane during the March/April 1963 CLC column in this magazine. Basically, it referred a portion of the line drag (DL) equal to (T) applied to the line-guide. This may not be 100% valid, since the lines slide through holes, but wear on the back of such holes proves some force exists. Right or wrong, we then searched out a coupling force to keep the airplane from turning into the circle. The reacting couple turned out to be CF and Cen­tripetal force if the CG were moved forward in space to develop an arm between them. The resultant angle turned out to be exactly the amount as (∞) from the last paragraph. When the bellcrank center is exactly on the CG, and if thrust is exactly through the CG the force at the line guide will disappear, if (∞) is correct. It should be reemphasized that bell crank pivot should be close to the CG, to reduce the bending at the line-guide which can cause stiff controls. At the time we didn't have a reliable drag coefficient for the lines, so progress ceased. Receipt of math from Rex Powell and Charles Klabunde provided an equation for line shape and angles (∞) and (β) Eq. 4. They had some trouble agreeing on drag coefficient (Cd), otherwise complete agreement existed. Their work disclosed that with proper manipulation and substitution (∞) was indeed proportional to the ratio of DL to CF. Also they proved the centroid of line drag was at a point three-quarters of the distance out from the handle. Thus airplane thrust is three times handle thrust. It was further shown that since both DL and CF are proportional to V2, the system angles should be independent of velocity. This turns up frequently in our aerodynamics and, when estimating, we take advantage of it. However, Mom Nature wasn't so kind as all that there. (Figures-Ed.) Enter the villain in this piece, Mr. Reynold's marvelous number. Osborne Reynolds was first to discover, understand and define the effects of object size, shape, speed of flow and viscosity of medium. Crudely put, he found that if two objects have the same shape but different size they will not have the same drag coefficient (or lift coefficient), unless speeds of flow and viscosity are varied to make their Reynolds numbers equal. (Eq. 5) is a simplified version of this with the viscosity held constant for air under NACA standard conditions of pressure and temperature. When this is done, R becomes proportional to V and "some dimension defining length in the direction of flow." This dimension in our case is (d) the dia. of our lines in inches. 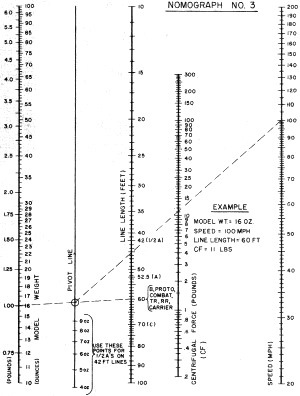 Our lines are the same diameter from handle to airplane, the same shape, and air viscosity is constant, but (V) varies. So we can't completely ignore velocity because Cd does not remain constant from handle to airplane. Reverting to experimental data, by old timers, it was found that, over our range of interest in R, Cd wandered from 2.4 or higher to around 0.98. Three different people ran experiments that appeared to agree well enough to believe. Unfortunately, the variation wouldn't nicely convert to an equation so we could plug it in. We were held for the moment to saying "Let's use CD = I." This gave a fairly reasonable number considering we were looking at thin, dirty, vibrating lines. But there was more to come. 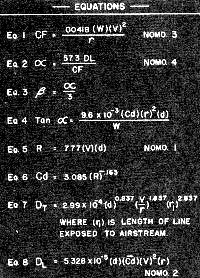 Ed Fort sent along a complete line­drag equation using an approximate equation for Cd as estimated by F. Eisner (Eq. 6). By substituting for R in terms of V and d, and solving a definite integral he allowed as how total line drag was per Eq. 7. One glitch in this Cd, it continued decreasing where experimental data proved an increase occurred. This would cause error in large lines and high-speed airplanes like C-Speed ships. But it was the best yet. 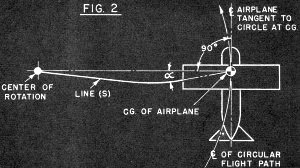 Pete Soule showed up one evening with a solution giving "effective line drag" based on thrust horsepower used to pull a portion of the lines (Eq, 8). He had also resolved the Cd problem by finding an "effective drag coefficient" based upon the Reynolds number of a line traveling at airplane speed. This bit involved complex curve fitting by Gaussian Quadrature (Who he?-Ed. ), and I'll leave it lying right there. The validity is unques­tionable so we constructed the final nomographs which appear here. You think that part was tough? Those are the answers. You should have been around for the questions! Two other gentlemen got in hot licks. Piper Mason went at the problem with a jet model and careful observations, outlining a good test method. Bob Ormiston's observations pretty well concurred with what we finally got. What did we get, you ask? 1. An angle between the CG and the line-guide which if built into an airplane will fly that airplane squarely tangent to the circle; theoretically providing least drag, most thrust and good line tension. 2. If you don't want to fly squarely tangent to the circle, you can correctly bias the angle to suit your whim. No Guesswork when yawing in or out. 3. 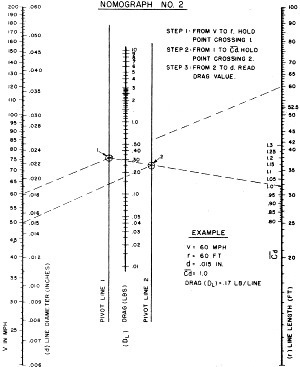 An exact method of determining the line drag the engine has to move. This will lead down the musty corridors to finding airplane drag coefficients, measur­ing the effect of streamlining, engine hop-up, prop thrust etc. We still need 1% accurate engine Bhp characteristics and any kind of propeller thrust data. 4. A basis for evaluating the best techniques for "whipping." And we finally opened a door that was closed. For about two years we subjected the calculated results to flight testing. Speed work by Roger Theobald, TR by Pete Soule, Rat and TR by John Barr. Stunt by Roger Wildman and "li'l ole line-maker me" dashing around with Combat, Carrier and 1/2­bugging all concerned. Each time we carefully adjusted speed and CG-to-line­guide relation to airplane weight we con­firmed the accuracy of the calculations. Just to keep it from being too simple we got "wind." Real briefly; wind, when headed directly into, causes an additional line-drag load, this one uniform (like the catenary) so TH and T to balance it are equal. It can be troublesome since V is not increased and is sometimes decreased which means ∞ will get larger. Upwind the nose pulls in. Downwind the effect is opposite. Jolly old experience (the results of poor judgment) shows us the ½A through 0.15 sport airplanes and all stunt types need increased line rake for breezy flying. Reasoning process, backed by flight work, says for large Cd, like with slow velocities and small lines, the build up of drag is more drastic. Also, slow basic speeds (around 50 mph) mean a 30-mph wind is over 50% of the base speed. So we simply provide these air­planes with extra holes in the line guide to increase rake in 1½° intervals. hold down lateral glitching on tight(?) corners. Half-A's generally are marginal on basic line tension, so we must guaran­tee that they'll stay under control. Speed jobs are still subject to more testing, but don't bother correcting for wind. Combat, Rat and TR ships have worked out best with ideal calculated angles. 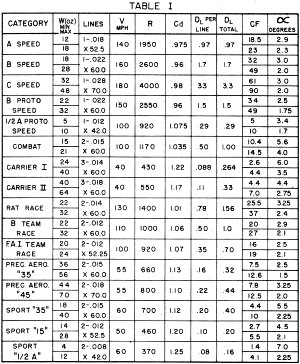 Carrier ships are calculated at 40 mph speed to cover the speed range accurately. Look over Table 1 for some extreme values in any category. Lines used are either required by rules or "most used" size. Weights are a little "outside" both directions. Final numbers pretty well box in each category. Numbers are "straight", no adjustment for wind. How about engine offset and rudder? The facts vary widely so that each case is a new game. The CF-DL force is much larger than the combined forces of any normal engine offset or normal rudder area. Again Stunt and ½A sport must be evaluated each to its own. IF you build-in the right ∞, bad judgment on engine offset and rudder area won't hurt much. Incidentally, the side force from engine offset isn't what we look for, unless you put in 100 or more. We examine the thrust line's distance in­board of the CG (it had better be inboard) to evaluate its turning moment to keep the nose headed properly under all weird conditions. If you want to tell me about that extreme case that shoots all this down, be very certain you send all of the facts! There are no mysteries; only a lack of complete knowledge. We have not deliberately ignored the Scale buffs. Your problems are always very special and we recommend that you play the game straight. It was convenient to end the weight scale on Nomograph 4 at 100 ounces, but if you have something heavier, divide the weight by 2, perform the calculation and double the CF. Nomographs and Procedures: The nomograph is a handy tool, similar in operation to a slide rule, in that logarithms of numbers are added or subtracted geometrically to perform multiplication or division. The two dimensional layout essentially operates on the principle of similar triangles allowing answer or pivot line's location to automatically include constant factors. Each nomograph is designed to solve a specific equation; making it ideal for often-used calculations. The only other tools necessary are a straight edge, preferably clear plastic (and very straight) and a thin sharp pointed instrument (like a pencil). Throughout the projected series we will provide nomographs for all significant mathematics. For practice you might solve the examples in Table I to see how estimates of points are handled. Let's take the "Sport 35" at 18 ounces for a trial run. Step by step: (Note-Examples shown on Nomographs are to demonstrate procedure only). 1. Place pointer on V scale (LH) at 60 mph. 2. Slide straight edge firmly against pointer and move right end until it lines up with 0.015 line diameter on RH scale. 3. Read answer of 700 from center scale. Now you have the whole basis. Hit the first point with pointer, slide straight edge to it, swing edge to other point and read. B. (Cd). This one is simply read from Graph I. 3. This time instead of reading, lift pointer and move over to where the straight edge crosses Pivot Line 1. Place pointer there. 4. Holding edge against point on PL 1 swing edge down to 1.12 on the Cd scale (inside R H). 5. Pick up and hold point at Pivot Line 2. 6. Holding point at PL 2, swing left edge down to 0.015 line dia. (d). 7. Now read the answer from Drag scale (DL) (0.20 lb/line ). 1. Pick up model weight (18 oz.) on LH scale using inside divisions. 2. Set straight edge to cross line length scale at 60'. 3. Pick up and hold crossing of Pivot Line. 4. Swing edge up to 60 mph on RH Speed scale. 5. Read answer from CF scale as 4.4 lbs. 2. Pick up line drag on DL (LH scale) at 0.40 lb. 3. Set up straight edge to cross CF (RH scale) at 4.4 lbs. 4. Finally! Rear rake either in degrees (5.5°) or in inches back in 10" of span (0.98" in 10"). The latter method is a bit more accurate for layout purposes, particularly if you don't have a good big protractor. The whole operation should take less than 5 minutes and both speed and ac­curacy improve with practice. Wrap Up: One last item. The angle we calculate is partially phantom, in that it falls exactly half way between the line guide holes for a two-line system, when the lines are equally loaded. That "equally loaded" is important. As the elevator is moved from neutral the point shifts to the line under greater tension. If you operate a limited bell crank movement, as in combat, the load will be carried completely by either wire during maneu­vers and the point of action will coincide with that lead out. These facts dictate that line-guide holes should be very close together or through the same hole. One' hole is practical only if you connect the clips inside the wing, or if you stagger the leadout ends. Otherwise the holes should never be farther apart than one inch, preferably closer than a half inch. With a three-line Robert's system it is conventional that pull on the middle line closes the throttle. It is desirable to bring this line out closer to the aft line, also arranging controls so that the aft line is "UP". This trick will allow slow flight at maximum yaw angle. The over-and­under lead-out system in Stunt is somewhat shaky, since the airplane responds in the lateral direction (roll), generally unfavorably, if you're looking for maximum smoothness in sharp comers. If, perchance, your use of these data shows apparent errors, please try to consider every variable involved before you condemn us. Many carefully observed experiments have been performed to establish our high degree of confidence. If you still have trouble ship us every bit of information and we'll check it out.